It’s fair to say that the 3DS didn’t have the start that Nintendo was hoping for. Launched amid high expectation and a groundswell of three dimensional hype, the system initially struggled to find an audience; it took a price cut and an injection of big-name quality software to bolster its commercial fortunes and allay the fears of Nintendo’s increasingly nervous shareholders. Given that the console is only now finding its footing, you might assume that the last thing it needs is a revised version hitting the market – yet that’s exactly what's happened. Of course, this being Nintendo, it’s hardly an unexpected move. The company has a history of incrementally refreshing its portable hardware; the Game Boy Pocket, Game Boy Advance SP and DS Lite are all evidence of this. Like those machines, the 3DS XL is outwardly different but internally (almost) identical: it features the same hardware, screen resolution and camera type as its direct ancestor. Only the size has changed — the system is noticeably bigger than the original 3DS, although it retains roughly the same thickness. The most obvious advantage of this increased size is the screens – the top display in particular is a whopping 90% larger than the one on the previous console, although as we’ve just touched upon, the resolution is unaltered. The 4.88-inch screen certainly makes a difference when playing games, making them bigger, bolder and consequently more visually alluring, but it brings with it a degree of pixellation. In terms of overall brightness, viewing angles and colour balance, everything seems exactly as it was before. Another welcome side-effect of the enlarged casing is comfort – while it’s certainly not true for everyone, a worrying percentage of owners of the first 3DS have complained about hand cramp, something that we can personally vouch for here at Nintendo Life. By opening up the console’s interface and spreading out the various pads and buttons, the 3DS XL feels roomier and consequently more pleasurable to use for prolonged periods of time. Naturally, you’d expect a console with bigger displays to soak up more battery power, so Nintendo has wisely taken this opportunity to increase the stamina of its new system. A bigger case offers the potential for a bigger battery, and the one inside the 3DS XL is able to achieve around six hours of play, although this can be lower, depending on what activity you’re involved in. This is a marked improvement over its forerunner but it’s still not enough in our eyes. The fact is that modern handhelds are advancing at a faster rate than the rechargeable cells which power them. Nintendo has also taken steps to safeguard the console's digital future by bundling a 4GB SD card, which offers double the size of the 2GB version included with the original 3DS. It’s a necessary move when you consider the company’s plans to make all first-party 3DS releases available for digital download after 17th August. Other changes include a non-telescopic stylus (which is now docked on the side of the unit, rather than on the top), a revised 3D slider which ‘clicks’ into place when using the 2D mode and a row of physical buttons along the bottom of the screen, which replace the odd single-piece panel on the first iteration of the hardware. Aside from that, this really is just the 3DS writ large. You won’t find any other technological enhancements hiding away inside the casing, which is disappointing but entirely understandable – by adding in new features at this early stage, Nintendo would effectively divide the market and alienate early adopters. So should you rush out and buy a 3DS XL? It depends what your current position is. If you’ve held off joining the 3D revolution then by all means, grab one. It makes more sense to pick up this version of the system because the bigger screens and improved battery life make it a superior option to the original console. However, if you’re already a 3DS owner, the outlook is less clear. To be perfectly honest, we can't shake the feeling that the 3DS XL fails to offer enough of an improvement over the previous model to justify shelling out all that money. When you consider that the painful process of porting over your data from one 3DS to another, as well as the fact that in the UK and Japan, the new system ships without a power supply and charging dock, the notion of upgrading becomes even less appealing. We also have to admit that we prefer the look sharp, edgy look of the original system – the rounded corners of the XL variant look a little cheap, although this is purely personal preference, of course. Still, if you’ve struggled with the size of the 3DS and want something a little more comfortable, then Nintendo’s new portable could be what you’re looking for. Just don’t expect a revolution – this is more of an evolution. If you've picked up a 3DS XL and need to know how to transfer your 3DS data, check out the video below. Still looks incredibly ugly to me. I love the size of the original 3DS so I'm not going to get an XL. Can't complain with options though. YES. A review that doesn't hate on no CPP. I love you NL. But yeah, this sounds about right. Still... WHAT THE HECK ARE THE SHOULDER BUTTONS LIKE? It's still a day one buy for me no matter what anyone says, even though the mentions of pixelation worry a bit. I'll just keep my current 3DS. Hope this sees success, though. Sounds about what I expected it to be, nothing too special I'll stick to my old system. Actually, what's the pixelation like? Is it more, jagged, and spiky, like the original, or just really bad, sprite-looking? I can't tell from those pics. It honestly doesn't look as bad as all the reviews are saying but it still worries me a bit. The device itself looks very ugly to me. Although you can play well or even better on it, it's still ugly. @Nibelilt I guess that depends how close you hold it to your face, because of the bigger screens your less likely to hold it closer and therefore its less of a problem. Yes, you can certainly tell its not an Apple Retina screen, I don't think its a big problem. @Terave interesting, I much prefer this design! I'm extremely excited to be preordering this I've held out on getting a 3DS specifically because of the small screens, hoping they'd bring out a bigger one & they have The 3DS XL isn't meant to replace the 3DS because afaik they're going to sell them side by side so its win-win for all Aug. 23rd can't come soon enough. I like the design. It's good how simple it is, and it will be a nice change from the original model, I think. I especially like the new rounded edges and the fact it's going to be very smooth, no doubt. I find it curious that in spite of the added weight, all the reviews I've read have stated the system is more comfortably regardless. The form factor is visibly improved with the rounded corners and spaced out buttons, that's for sure. I already own a launch 3DS, but it has seen a lot of use and the touch screen has become inaccurate, and cannot be calibrated. With the matte finish instead of the absurdly smudgy gloss finish, the enlarged screens for better 3D effect and better drawing (especially in Letterbox and Colors 3D), plus fringe benefits of automatic streetpass hits off my old system, this is definitely something I look forward to picking up in about 17 days time. @BenAV Did you see the rumoured Majora's Mask 3DS XL. That would make me buy one. The whole thing is probably more comfortable due to the multi-click screenlocks, the rounded edges, and the matte, plus the fact they've had more time to fix the "slippery" bits from the original model overall. I'm getting the silver day one. Looking forward to this, looks a lot better than the original in pretty much every way. At least they've fixed the problems I have with the original. It's probably not real, an image of that quality for a game not even announced seems all too unlikely. It's an extremely well made image however, that Purple 3DS XL with the Majora's Mask mark in the free space is awesome. I really like the way it looks, and I think it has advantages in terms of finger prints and comfort. I'd love to get one, but it seems a little pricey for just getting another 3DS, when I still don't have a Vita or 360. Thanks for the opinions, guys. If my 3DS should break some day i'm sure i'll consider the XL. Or if i can get it relatively cheap one day, but that's more wishful thinking, even the DSi XL hasn't hit my sweet spot yet. "Just don’t expect a revolution – this is more of an evolution." - Isn't this what the 3DS is all about anyway? I just have a single question: Can you import all your original3DS data to the new one? I know we can pass software purchases, but how about collected Miis, puzzle pieces, hats, steps, history charts and such? Is it possible to convert all data on the original SD card to a new one? This is the only thing keeping me between the newer model and I have yet to find out if it's possible or not to do so. I'm sold. I just wish I could get a silver model instead of our bright cheery red or blue ones. I'll go with the blue, though. Here's all you need to know about system transfers. So I assume then it is basically exactly like the DSi XL, except a 3DS of course. I am in love with my DSi XL really, and it's so easy to pay the price of slight pixellation for larger screens which provide a much better experience in my opinion. It's easier for me to immerse myself with a larger screen. I will be buying a 3DS XL for sure, but I definitely want to wait for more color options or special editions! Has the vertical line scratch problem (caused by the raised edges of the bottom screen) been solved? Got mine on pre order from propel gamer. only £164.99. Keeping my 3DS Ice White though. It's super! I wonder what the capacity of the battery is compared with the original in mAh. If it's a big difference to light up those bigger screens, then maybe the system will last an extra day or so in sleep mode. I like the prospect of better Battery life,and the fact that the screen won't be a finger print catcher like the original,and obviously the bigger screens are great pros to get it. But the fact we don't get a charger,and having to pay more for it the US,it kinda puts me off it. £150 with a charger,and game,or no deal. I like the XL version mostly because I heard that the 3D Effect are better (but I think that's a myth), mate colors are more appealing to me (it reminds me the great DS Lite in Crimson/Cobalt-Black version that I have).and the battery holds slightly longer. But again I'm sceptical to those "BIG" screens (the upper screen is almost like in Vita) and those ugly nameless buttons that in normal 3DS are Select, Home, Start and Power. And there's the price issue without the charger, so I think that I will buy the normal 3DS because for me a handheld is supposed to be a cheaper alternative from Home Console, so for me the limit is 150-170 Euros for a portable device. @6ch6ris6 It's the console inside,and not the horrible design. @Chrno-x I've not found any difference with the 3D effect using the XL, it seems to have the same issue around the "sweet spot" and doesn't really appear "more" 3D than before. @mirnkaya I don't know if anyone has had enough time to thoroughly test that, but looking at the design, Nintendo have made efforts to prevent it. Look at the location of the bumpers on the top half; they are lined up to land on the frame around the lower screen, hopefully resolving the previous iterations' problem with scratchs. Keeping the original, but just because i don't how many good titles will have WiiU in the first months and, for me, Home Consoles are always on top of consideration. Are u permitted to take closer shots of the display to get an idea of the pixelation? @mirnkaya Yeah, looking at the pictures it's fixed. if you look even closer you can see that those bumpers are in line with the lower screens "frame" and that they will be hitting that little space right next to the 'select, home, start' space. Which fixes the problem. Just gonna give it a try on a retailer before i buy. Darn, this looks awesome...but its pointless for me to buy a console I already own. im looking to buy a second console in november since i currently share with my bro but hes moving away. I still feel like upgrading though the pixellation mentioned is a little concerning. I had heard it was hardly noticeable and in fact the bigger screens seemed to make everything brighter and more colourful? Off topic: Those Majora's Mask pictures look so real! I really hope it gets announced soon. The special 3DS XL looks cool but purple isn't exactly my colour. I have a question about the original DS compatibility, does the 3DSXL still make DS games look a little blurry? Or is it crisper this time around? The 3DS XL is clearly for the 40-years-plus market segment who got the DSi XL but did not change to a 3DS just yet. 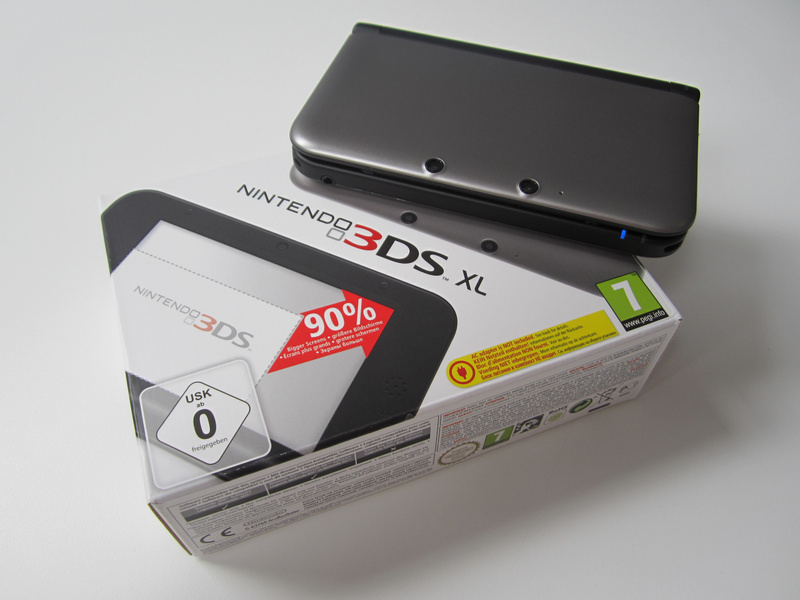 So it's curious why would anyone think that the XL would be an "upgrade" for current 3DS users. I am very happy with my 3DS. It packs a lot of features in a compact package, with sleek, edgy design. No way am I upgrading, as the reviewer has indicated, not enough of an upgrade or even enough of an evolution. If it was available at launch alongside the original 3DS at around about the prices they are now - it would've been an insta-buy. For me now it's a rip-off. If I wanted hyper-visualised gaming on a bigger screen I would get the Vita anyway which has a different library of games. Nintendo isn't even promoting 3D that much anymore as the exaggerated eye health fears hurt sales at first. Majority the advantages are purely aesthetic. 50 quid more for aesthetic appeal in this day an age of economic difficulty would be like cosumerist extremism! Don't forget to factor in the cost of a charger when talking about the price of the XL (£8 more at shopto.net for example). Would have bought it in a heartbeat if I didn't already have a 3DS. But yeah, size changes aren't enough of an upgrade to warrant buying new systems for me. Two hundred bucks is a lot of money to pay on something that my original 3DS already does. So the very early impressions from the French press about the system employing some kind of filter to ease the jagginess of the enlarged image must have been mistranslated. Bummer. But if this improves the viewing angle even a bit, I'm totally sold! I never hated the 3DSXL, I just wasn't interested since all it offered was bigger screens. Perhaps the next 3DS or the next Nintendo Handheld, but not 3DSXL. I'm getting one mostly for the larger screens. I'll keep my Zelda 3DS that I currently have, but with poor vision, bigger screens are very appealing. Bigger =/= better. Sorry, Nintendo. The design looks ugly and bland, like the dsi and dsi xl. The only way I'd buy it if that Majora's Mask Edition Actually came out. It'll be like when I decided to get my OOT 3DS. Looks like I will be keeping my 3DS "Classic", for the time being. I honestly don't get why everyone's saying it looks ugly. It looks like they tried to use up some of the negative space on the console rather than just increasing the unit's size, which is nice. This looks too small. Someone wake me up when we get the 3DS XXXL! Looks beautiful to me! Definitely a better design. One thing no reviewer will mention is, "Does it fit in your pocket." I'd really like to know. Pre-ordering this sucker this weekend. Kid Icarus: Uprising will be even better with this! Hmm great review - like always on this site. As for the people that have been asking if it fits in your pocket, I've seen it at a store here, the guy there was nice enough to let me fit it into my pocket (but not walk away with it) and yes - like it says in the review - its smaller than the original gameboy or the DSi XL, me being a grown man of 30, I can easily fit it into any pocket on my pants - but Im not the type of guy wearing ultra tight jeans - so... anyways I'm really tempted about this but I'd love more choice about colours. I bet if I hold off until christmas there will be plenty more colours available or maybe even some nice bundles! I'd love an all black or all white one (like the one in japan). very tempted. but ill keep my 3ds as long as i can. when i fails me,ill consider the XL. Better design, If I was a portable gamer I would get this. Am I the only one who's actually put off about the stylus? 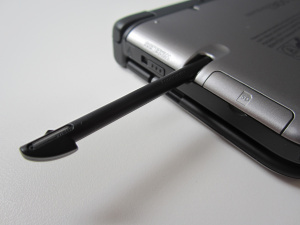 I loved the original stereoscopic stylus and it's positioning kept it from falling out like it did lots on my Nintendo DS Lite. This feels like a step backwards to me, but still getting it, nonetheless. THIS. I would buy this so fast it's not even funny. Majora's Mask is still my all-time favorite Zelda title, and out of all the XL pictures I've seen recently, this limited edition mock-up looks better than the standard models. I really wish this were real. More on topic, I'm probably going to be getting the black model sometime around when it comes out. My biggest gripe about the XL is the color choices, honestly. I think the red and blue systems coming out in NA look goofy, more like a toy than what most of the sleek colors of the original 3DS did. I'm fine with my original 3DS, I prefer the design and it fits in my pocket. The 3DS XL might be able to fit in my jacket pocket but I doubt it would fit in my jean pockets so that would mean that I couldn't take it with me if its too hot for a jacket. I prefer smaller handhelds anyway. Oh & I was quite suprised to find out the 3DS XL will include an AC adapter in Australia, so says Nintendo: http://gamesites.nintendo.com.au/nintendo-direct/en_AU/index.php I guess it makes sense since Australia is a smaller market hence less expectations of people having a charger already. Though the webpage doesn't mention it, I hope it comes with the cradle too. I certainly am going to upgrade from my current 3DS, but I don't want the colours that are being offered here in the states. So I will wait for cool sliver/gray one that Europe is getting to make it's way over here to the US. Awesome, makes upgrading that little bit easier! Thanks for the second opinion and on the comments back to everyone. It definitely paints a clearer picture of things to come. I currently own the original and will purchase the XL as well. I had the DS and DS lite before and now I'll have the 3DS and 3DS XL. Funny that my reasoning for purchasing multiple systems then is the same reason now: to finally be able to play face to face Mario Kart with the family! Seriously, DS' Mario Karts are the best for me! Speaking of the case design; I prefer the sharp angles to rounded edges myself. Also, about Damien McFarrens Bio... what exactly are you saying? Are you telling us that damien likes 'wood' in his hands or to wrap his hands around his wood? For a Bio that IS a bit confusing... well what then? wooden software? Duh. :"He loves getting his tiny hands on (?) ,,,,especially if it’s [made of] wood..."
@Scollurio Thanks so much--I've been trying to get that question answered since the initial announcement. I'll be upgrading my 3DS day 1. What I really want to know is how DS games look on those screens. I'll more than likely get it anyway, seeing as I have waited for over a year to get a 3DS (a lack of money, not waiting for a revision or games) and I may as well wait another month. Besides, if it's awful enough I'll still have my DSi. Ok so my big question is this... How do VC games look when played at the original resolution (with the Gameboy borders) ? Do they look sharp or a blurry mess like they do in standard mode? Same with playing DS games, how do those look in the original resolution mode? BTW... The new design looks 100x better than the classic 3DS. No more of that ugly sharp overhang, and none of that stupid half glitter paint job. I'm tempted to get one. But... it's so ugly compared to the original! Oh, what a dilemma! With regards to the battery life, as you said, battery technology isn't keeping up. It's not like there's much Nintendo can do about it. You can add a bigger battery, sacrificing light weight and smaller size, or you can deal with short battery life. I'm fine with the 3DS I have. Maybe in a few years I might consider upgrading, but by then I'm sure Nintendo would have released an even newer 3DS revision. I'll probably get a 3DS XL after I sell my old one on eBAY as long as I can get a reasonable deal by including the charger, the 3DS case, and the CPP alongside the system. Since I spent well over $250 including the accessories, I don't want to feel like that I'm being ripped off. I will stick with my original 3DS until I see a major overhaul (which is not just larger screens, but hopefully a better viewing angle for a better "sweet spot", an even better battery, and a 2nd CP. They can keep it XL size for all I care, but give me something, like NL says, "revolutionary" in the next iteration of the 3DS and I'll be there to buy it. Period. This is ok, but not enough to move me solidly off my perch. Day 1 purchase, mine is already paid off. Does anyone know if the 3DS XL suffers from the same white bleed issues as the original 3DS? If you're in 3d mode and you're viewing a light area on a black background, the other eyes' view will bleed into the wrong side, leaving a white phantom image next to the object, no matter how well you've hit the 3D sweet spot. Great review guys. I assumed as much about the redesign but your review proved my assumption was right. If something were to happen to my current 3DS than I would pick up the XL either that or it comes out in an awesome color or has a good holiday bundle deal but other than that I will pass. Now if they come out with a 3DS with a second circle pad than I would be all over that. I still prefer my pink ,glossy cake-layered 3DS XD. And what's the point of paying $200 for something you already have? I don't think I'll upgrade. The bigger screens are nice, but then again, whats the point of a portable device if its a burden to carry around. This looks like an extra special Wii U controller to me....maybe they released it so that it can be used interactively with the Wii U better. Ugh... my mind keeps jumping between whether I should switch to the XL or get a new original 3DS model. With my L-button completely dead and my warranty expired, I would like to just get a new 3DS, and although I can see all the pros of getting an XL, the original model still looks much better in my opinion. Especially since I could get it in that sweet shade of purple now. I managed to get my gba triggers fixed with a cotton pick! I wish they would release the gray model in the U.S. I really want one. I'll probably pick up one of these, but I can't decide which colour to get. I want to try it out in a store first, but I don't think I'll be getting one. I don't understand how the xL will be more comfortable. I'll still be playing StarFox 64 awkwardly and painfully because the A button is too far to the right. But I think it will make the L & R buttons easier to use, right now I can only use one or the other. And Nintendo is answering that list with the Wii U Gamepad, so I have that to look forward to. Oh! And the inside camera should have two lenses so you can take 3D photos/videos with the inside camera!!! 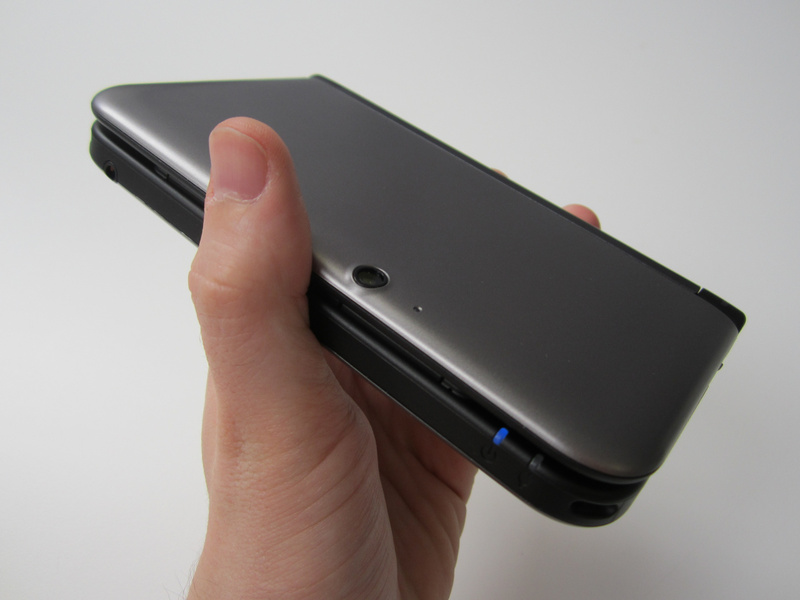 Sorry if this has already been asked, but is the sound volume on the 3DS XL greater than that of the original 3DS? One of the biggest problems I had with the original was the sound output; it never did seem loud enough. If you have big hands it'll most definitely be more comfortable. Not to mention this model doesn't have any pointy edges like the original model and the shoulder buttons are bigger as well. To me it looks to ad a LOT more comfort compared to the original model. One last comment. Can we please drop the Region Code on the 3DS already!! I wanna play Gundam!! It's a very sleek design. I like it alot, and it looks like It's pretty comfortable to use compared to the original 3DS model. No screen tests with actual games for us to see with our own eyes! Review is half- assed. We already new everything that was written, it would have been better to show us what we can expect with pixellation. I like the new look and bigger screen might just trade in my 3DS for the XL. 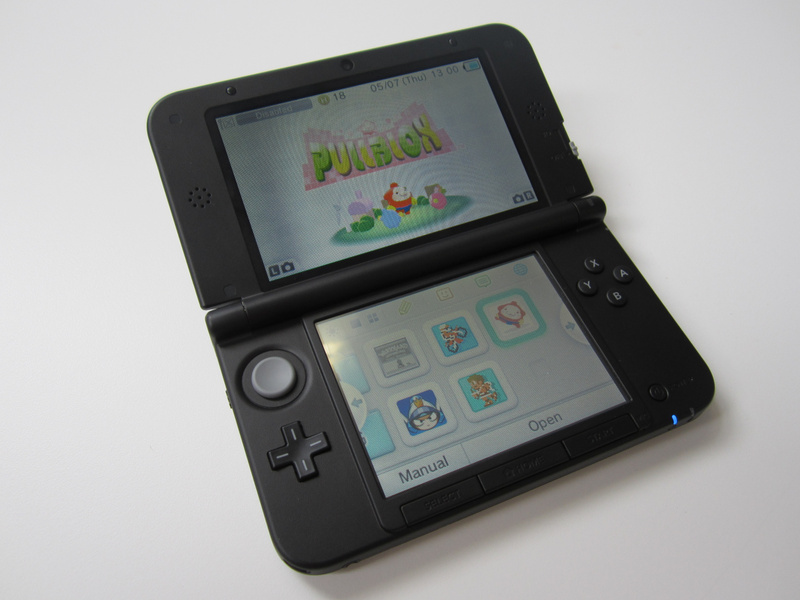 Is migrating your 3DS games and data to the new 3DS XL really as "painful" a process as is described here? What does it all entail? If it's all the same as far as system guts go, then it's probably too much to ask that the appearance for original DS games on the new 3DS XL would be better than the original 3DS (i.e. : fuzzy as a peach skin). Just as well, I'll probably get one (likely after a price drop or two). The DSi XL spoiled me on portable gaming on larger screens. I'd rather not have a big portable gaming system. Besides, does this XL even fit in your pocket? @Janett Who already had a 3DS XL?